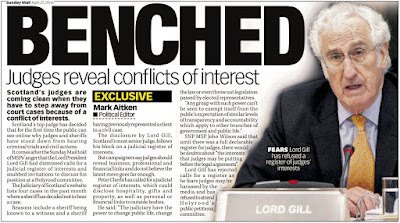 ‘Independent’ lawyer’s self regulator continues to look after profession. SCOTLAND’S ‘independent’ self regulator of solicitors – the Scottish Legal Complaints Commission (SLCC) has refused to publish the identities of tens of high profile law firms and solicitors across the country involved in serious malpractice resulting in upheld complaints & compensation payments to clients. 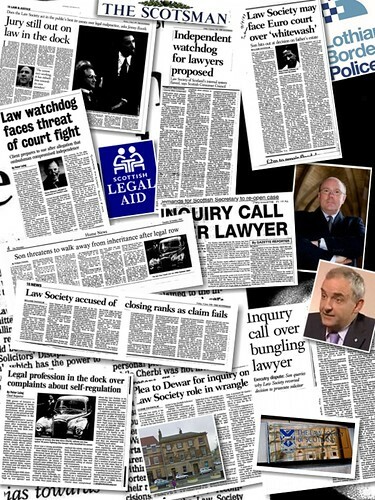 The ‘independent’ SLCC – controlled by the Law Society of Scotland and funded by clients legal fees to solicitors – also revealed brief details of case summaries where small payments starting from a range from a miserly £1 to £299 and up - have been paid out to the bereaved families of deceased loved ones. 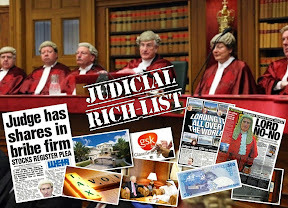 The paltry compensation sums were paid out after lawyers look advantage of a regular scam by ripping off the wills & executry estates of dead clients. Even in cases where tens of thousands of pounds were plundered from bank accounts and assets relating to wills handled by solicitors - a mere few hundred pounds were paid out to families & loved ones who were intended to inherit the possessions of their relatives. 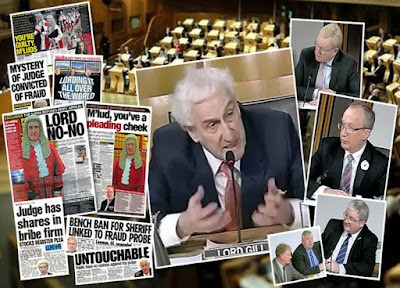 The SLCC has refused to publish figures quoting actual payments or any figures identifying the extent of the actual losses suffered by victims after lawyers fleeced client assets and executry estates. 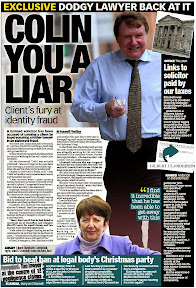 Instead, the lawyer backed self regulator has set out a vague structure of figures, which allow the lawyer backed regulator to make spurious claims of protecting consumers while in actual fact failing to deliver back to victims what is estimated to be tens of millions of pounds a year defrauded out of the executry estates of deceased Scots and their families - by the legal services industry. 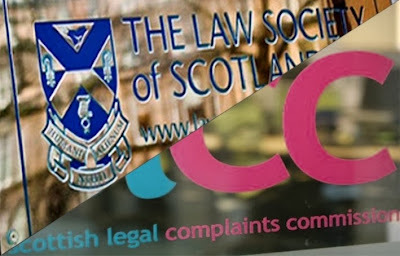 However, a recent media investigation into the Scottish Legal Complaints Commission recently revealed most of the SLCC’s key staff and investigators are in-fact families, friends & business associates of solicitors, reported here: 'Independent' Scots legal watchdog consists of solicitors’ husbands, wives, sons, daughters, cousins, friends, & employers. 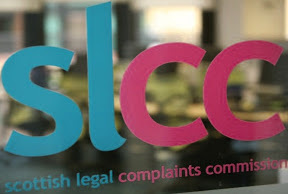 The Scottish Legal Complaints Commission now publishes anonymised Determination decisions – which give a brief description of complaints decided upon by the SLCC. 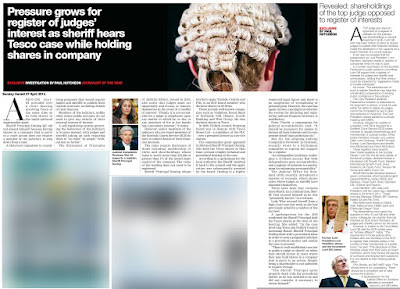 However, the heavily redacted case summaries crucially exclude the identify of law firms and solicitors involved in the complaints – meaning any consumer could unknowingly be using the same law firm or talking to the same solicitor – who has just been found guilty of dodging complaints investigations and ripping off other clients. 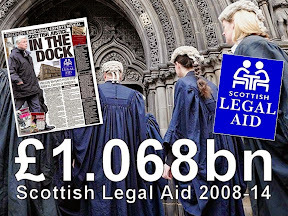 Where a complaint has been upheld, the total amount the SLCC can award is capped at £20,000 – a cap set by the Scottish Government & Scottish Parliament after the legal profession lobbied against higher amounts of compensation during the passage of the Legal Profession & Legal Aid (Scotland) Act 2008. 16/1 Residential conveyancing: The complainer complained that the named solicitor had (a) failed to obtain instructions from the complainer's partner until a week before completion of the sale, and (b) failed to ensure that there was a provision in a Minute of Agreement for the sale proceeds to be held on deposit, rather than distributed on completion of the sale. The Determination Committee was satisfied that the solicitor had acted correctly in distributing the funds, but that there was lack of effective communication with the complainer prior to the sale about distribution. The Committee agreed that the solicitor had failed to act in the best interests of the complainer by failing to clearly explain what would happen in the event of implementation of a Minute of Agreement agreeing to equal division of the sale proceeds. The Committee decided that both issues amounted to inadequate professional service. The Committee decided that the firm should pay to the complainer compensation of Band C for distress and inconvenience on several occasions. The Committee directed the firm to pay a Complaints Levy of £500. 16/2 Executry: The complainer complained that the opposing named solicitor had failed to respond to a significant amount of correspondence sent by their own legal advisor over a significant period of time. The Determination Committee decided that there was sufficient evidence to support the complaint that the firm had failed to reply to 12 items of correspondence over a period of approx. 20 months. The Committee agreed that the failure had resulted in an inadequate professional service having been provided to the firm's own client and having reached that conclusion, the Committee was satisfied that there was a direct adverse effect on the complainer. The Committee decided to uphold the complaint and ordered the firm to pay to the complainer compensation of Band B for inconvenience and distress and level 1 for actual loss. The Committee directed the firm to pay a Complaints Levy of £150. 16/3 Executry: The complainer complained that the opposing named solicitor had failed to respond to a significant amount of correspondence sent by their own legal advisor over a significant period of time. 16/4 Executry: The complainer complained that the opposing named solicitor had failed to respond to a significant amount of correspondence sent by their own legal advisor over a significant period of time. 16/5 Executry: The complainer complained that the opposing named solicitor had failed to respond to a significant amount of correspondence sent by their own legal advisor over a significant period of time. 16/6 Family: The complainer complained that the named solicitor had (a) advised the complainer at the initial meeting that the information relating to the source of the deposit was not required, but later advised that this information was vital and incorrectly alleged that the complainer had failed to provide this information at the initial meeting, (b) failed to communicate effectively by failing to respond to basic questions, (c) failed to proceed with division of assets and sale proceeds when instructed, and (d) failed to deal adequately with the complaint. The Determination Committee decided that there was sufficient evidence to uphold issues (a) and (c) as inadequate professional service. Regarding (a), the Committee agreed that the solicitor had failed to identify the client's objectives at the outset, and thus advised the complainer to pursue an un-necessary course of action. The Committee decided in respect of (b) that the client had been kept informed during the case. The fact that the solicitor had not been able to answer very specific questions about matters extraneous to the case had also been explained, and as such, there was no breach of the Service Standards. In respect of (c), the Committee was satisfied that the solicitor had delayed raising the action for several weeks. Regarding (d), the Committee agreed that the evidence showed that the solicitor had attempted to address the complainer's concerns, and that the suggestion to the client to seek alternative representation was unreasonable or unusual where dissatisfaction had been raised. The Committee decided to uphold the complaint and ordered the firm to reduce its fees by one third and to pay to the complainer compensation of Band A for inconvenience and distress. The Committee directed the firm to pay a Complaints Levy of £700. 16/7 Residential conveyancing: The complainer complained that the named solicitors and the firm had (a) unduly delayed registering the disposition, and (b) delayed informing the complainer of the mistake. The Determination Committee decided that there was sufficient evidence to uphold a finding of inadequate professional service against the firm. The Committee decided, (a) the solicitor had failed to prepare and register the disposition following settlement and had delayed registration by approx. a year and a half. In respect of (b), the Committee agreed that the solicitor had failed to inform the client that the disposition had not been registered timeously, and only after a number of months, once the defect had been rectified. The Committee ordered the firm to refund part of the fees (£100) and outlays (£30), and to pay to the complainer compensation of Band B for inconvenience and distress. The Committee directed the firm to pay a Complaints Levy of £500. 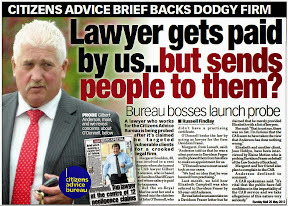 16/8 Family: The complainer complained that the named solicitor and the firm had (a) delayed/failed to obtain all of the husband's financial information, failed to set up meetings and failed to follow instructions to communicate with the opposing solicitor, (b) failed to provide consistent advice, (c) included incorrect information in the offer of settlement, (d) failed to thoroughly examine the proposals for settlement, (e) failed to submit cravings on the complainer's behalf, (f) failed to respond to requests for an interim account and failed to keep updated regarding escalating costs, and (g) delayed settlement negotiations. The Determination Committee was of the view that there was no evidence to support the complaint, save as for issues (e) and (f) regarding the failure to submit cravings in the Defence, as required by the Ordinary Cause Rules, and the failure to issue an interim account as per the complainer's request, or communicate adequately with the complainer about the increasing fees. The Committee was satisfied that these issues could amount to inadequate professional service, as there had clearly been a breach of the Service Standards for diligence and communication. The Committee ordered the firm to pay compensation to the complainer of Band B for the inconvenience and distress caused by the inadequate professional service. The Committee directed the firm to pay a Complaints Levy of £500. 16/9 Litigation: The complainer complained that the named solicitor and the firm had (a) raised an action incorrectly naming the complainer individually, rather than in the name of the business, (b) failed to lodge the application timeously, (c) failed to lodge a properly framed application and delayed amending the application. 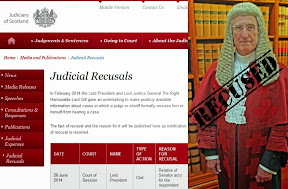 The Determination Committee decided that (a) there was insufficient evidence to reach any conclusion that the court action had been raised in the name of an incorrect party. However, the Committee was satisfied that (b) the firm had failed to exercise the normal care and diligence expected of a competent solicitor by delaying the lodging of the application, and (c) failing to properly frame and amend the application. The Committee decided to uphold the complaint and ordered the firm to pay compensation of Band D for inconvenience and distress. The Committee directed that no fees or outlays should be charged to the complainer. The Committee directed the firm to pay a Complaints Levy of £800. 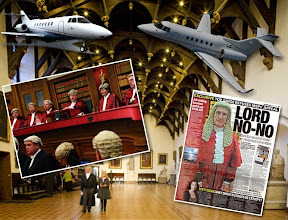 16/10 Litigation: The complainer complained that the opposing named solicitor and the firm had failed to act in the best interests of his client by unduly delaying the conclusion of the dispute for over 2 years. The Determination Committee was satisfied that the cumulative effect of the identified delays adversely impacted on the service provided by the firm to its own client. Consequently, the complainer suffered as a direct effect of the deficiencies in the service to the client. The Committee ordered the firm to pay compensation to the complainer of Level 4 for actual loss and Band B for inconvenience and distress. The Committee directed the firm to pay a Complaints Levy of £300. 16/11 Residential conveyancing: The complainers complained that the named solicitor had (a) failed to ensure that a Completion/Habitation Certificate was available at conclusion of the purchase, (b) failed to advise of the consequences of completing without the Certificate, (c) failed to take instructions/obtain informed consent before agreeing a retention sum with the builder's solicitors, and (d) failed to advise prior to completion that the property had not been passed as fit for habitation. The Determination Committee was satisfied that the firm (a) did not take all reasonable steps to ensure that their clients' interests were protected at settlement, and (b) & (d) failed to clearly and fully explain the significance of settling without the relevant Completion and Habitation certificates. The Committee accepted that the firm had not investigated why the Certificate had not been issued or asked about any underlying issues. Regarding (c), although the Committee was satisfied that the firm had sought instructions about the retention of £10,000, there appeared to be no evidence to show that the consequences of proceeding in the way suggested by the developers was explained to the complainers, and that they were not advised about what a Completion Certificate was or the implications of proceeding without one. The Committee ordered the firm to pay to each the complainers compensation of Band D for inconvenience and distress. The Committee directed that fees in the sum of £660 (plus VAT) should be refunded to the complainers. 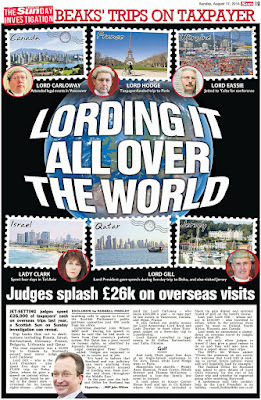 The Committee directed the firm to pay a Complaints Levy of £3,000. 16/12 Family: The complainer complained that the named solicitor and the firm had prepared an initial writ which contained a number of serious errors, including incorrect details of the children's address and what was in the children's best interests. The Determination Committee was satisfied that the evidence showed that the firm had failed to ensure that the writ contained the necessary averments and fundamental flaws, which resulted in the action having to be dismissed and resurrected by newly instructed agents. The Committee ordered the firm to pay to the complainer compensation of Band B for inconvenience and distress. 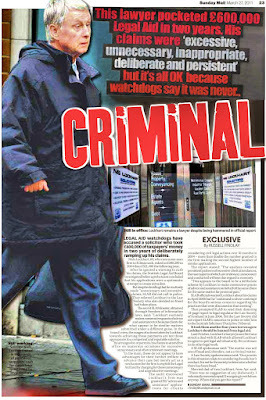 The Committee directed that there should be a full refund of fees (£700) and no further fees charged to the complainer. The Committee directed the firm to pay a Complaints Levy of £400. 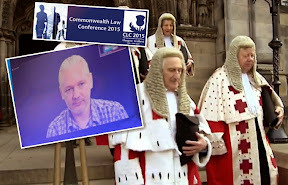 16/13 Family: The complainer complained that the named solicitor had (a) failed to deal with a Motion to recall the Sist and request a Proof, contrary to numerous requests, (b) failed to submit the Motion to Court and charged inappropriately for doing so, (c) unduly delayed sending the Motion to the opposing solicitors, despite confirming that this would be carried out the following week, (d) unduly delayed updating on the position regarding the failed submission of the Motion, despite having given an undertaking to do so, (e) unduly delayed reminding the opposing solicitors that a response was still outstanding, despite two reminders to do so, (f) unduly delayed forwarding correspondence from the opposing solicitors, despite being reminded and advised of the urgency of the matter, (g) failed to raise various financial issues with the opposing solicitors, despite numerous requests to do so, (h) failed to confirm advice provided in writing, despite having agreed to do so, (i) failed to challenge a report, despite having accepted instructions to do so, (j) declined to provide further advice until the outstanding account had been settled, despite this being contrary to the terms of business, and (k) failed to deal adequately with the complaint, by ignoring concerns. The Determination Committee was satisfied that (a) & (b) the solicitor had failed to enrol a Motion, despite having undertaken to do so and charged the complainer for having done so. Regarding (c), although the Committee was content that the complainer had been advised of a timescale, there was only a 4 day delay. The Committee was not satisfied that this short delay amounted to an inadequate professional service. In respect of (d), the Committee noted that there had been a 4 week period between the date when the solicitor intended to enrol the Motion and the failure to do so being advised to the complainer. 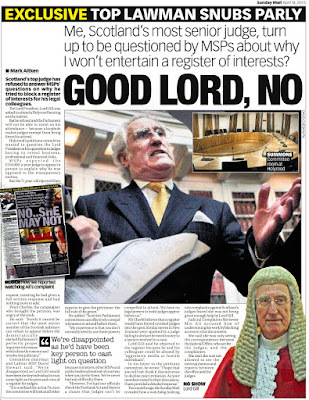 The Committee's view was that the solicitor should know the client's business at all times, regardless of when he actually remembered the oversight. 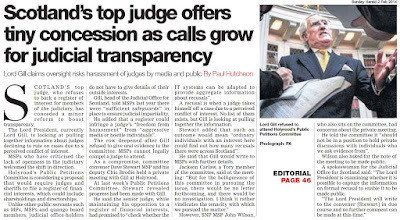 The Committee's view was that the delay was a breach of the standards of both diligence and communication and amounted to inadequate professional service. Regarding (e), the Committee was satisfied that there had been a 5 week delay, despite 5 prompts by the complainer. As regards (f), the Committee was satisfied that there had been a 4 week delay in the information being provided to the complainer, despite the solicitor being aware of the urgency. In respect of (g), the Committee agreed that the solicitor had failed to follow instructions in this regard on at least 4 occasions. Regarding (h), the Committee was satisfied that the evidence showed that the complainer had requested the information on a number of occasions, and that this had not been provided. The solicitor had the opportunity of clarifying the information sought after the meeting, as subsequent requests were made. In respect of (i), the Committee agreed that the evidence did not support the complaint that the solicitor had been asked to challenge the content of the report, other than in relation to fees. Accordingly, this issue was not upheld. Regarding (j), the Committee agreed that the solicitor had acted unreasonably by refusing to continue to provide advice to the complainer prior to the expiry of 30 days for settlement of the account, as allowed for in the terms of business letter. Finally, in respect of (k), the Committee noted that there was no evidence to support the solicitor's indication that the complainer had been invited to discuss the complaint, as per the terms of business letter. The Committee was satisfied that without written confirmation and the complainer having denied having received any such invitation, that there had been a failure to comply with the terms of business and that this failure amounted to an inadequate professional service. The Committee decided to uphold the complaint in part and ordered the firm to pay compensation to the complainer of Band C for inconvenience and distress. The Committee directed the firm to pay a Complaints Levy of £700. 16/14 Residential conveyancing: The complainer complained that the named solicitors and the firm had (a) failed to advise that a more in depth survey report should be obtained, (b) failed to obtain/discuss the terms of a timber report, (c) failed to follow up the issue of guarantees for damp treatment and woodworm, and (d) failed to advise of notification of timber infestation requiring full chemical works being undertaken. The Determination Committee agreed that the firm had failed to provide the complainer with documents relating to previous investigations of damp and timber defects and failed to advise the complainer that further investigations should be carried out given the terms of those documents. The Committee also agreed that one of the named solicitors had failed to obtain a copy of the report instructed by the complainer and did not advise about its terms prior to the conclusion of the missives. The Committee was satisfied that one of the named solicitors had failed to follow up the issues of guarantees and that the firm had failed to advise of the terms of a letter from the sellers advising that there was an infestation of woodworm and that full chemical works should be carried out. The Committee ordered the firm to pay compensation to the complainer of Band C for the distress and inconvenience caused by the inadequate professional service. The Committee also decided that the firm's fees should be reduced by 35% (approx. £250 plus VAT) and refunded to the complainer. The Committee directed the firm to pay a Complaints Levy of £1,000. 16/15 Residential conveyancing: The complainer complained that the opposing named solicitor and/or the firm had failed to register the sale of the ground or have the title deeds updated in relation to the part of the complainer's garden that the firm's client had purchased. The Determination Committee agreed that the solicitor had failed to record the title deed in favour of the firm's own client (the complainer's neighbour), resulting in an inadequate professional service to their own client and which had a direct adverse impact on the complainer. The Committee ordered the firm to pay to the complainer compensation of Band A for the inconvenience and distress and level 2 for actual loss, due to the need for a new deed plan to be prepared. The Committee directed the firm to pay a Complaints Levy of £200. 16/16 Family law; failing to respond: The complainer complained about the named solicitor and/or the firm had (a) failed to include information required in a Pensions Sharing Order and failed to ensure that the Schedule was attached to the Minute of Agreement, (b) failed to ensure that the Minute of Agreement was sufficiently robust regarding the pension entitlement and net proceeds of sale, (c) failed to intimate the Agreement and Decree to the pension trustees within the appropriate statutory timescale, (d) failed to distribute the proceeds of sale in accordance with the Minute of Agreement and unduly delayed discharging the bank loan, (e) inappropriately and without authority, deducted the fee note from the proceeds of sale without having issued a fee note, (f) erroneously withheld the balance of the proceeds of sale, (g) failed to raise a court action, despite having been instructed to do so, (h) failed to respond to the letter of complaint and failed to provide a breakdown of fees, and (i) failed to implement a mandate. The Determination Committee was satisfied that the evidence showed that the firm had (a) failed to ensure that the pension plan details were contained in the document sent to the pension trustees, (d) failed to distribute funds timeously, and (e) deducted fees from retained funds without the knowledge of the complainer. The Committee was not satisfied that the evidence supported the remaining issues of complaint or that there was lack of evidence to prove these issues on the balance of probabilities. The Committee ordered the firm to pay compensation to the complainer of Band B for inconvenience and distress, and that fees charged should be reduced by £100. The Committee directed the firm to pay a Complaints Levy of £400. 16/17 Residential conveyancing: The complainer complained that the named solicitor and the firm had (a) failed to obtain a Letter of Comfort from the Council and/or failed to determine the exact amount of the liabilities owed by the sellers in respect of outstanding Statutory Notices, and (b) failed to negotiate an appropriate retention amount in the missives. The Determination Committee decided that (a) there was evidence that the firm failed to take adequate steps to determine the liabilities of the sellers, and (b) that the firm failed to negotiate an appropriate retention. The Committee decided that the complaint should be upheld to this extent. The Committee ordered the firm to pay to the complainer compensation of Band C for distress and inconvenience and Level 4 for actual loss. The Committee directed the firm to pay a Complaints Levy of £800. 16/18 Litigation: The complainers complained that the named solicitor and/or the firm had (a) systematically lied regarding the action being taken in connection with the claim, and (b) falsely charged the complainers for costs in relation to water and planning applications. The Determination Committee decided that (a) there was sufficient evidence to support the complainers' contention that the solicitor had incorrectly advised them that various steps had taken place to progress the action, and (b) the solicitor falsely advised the complainers that the sellers would pay for the costs of the work, despite having obtained no undertaking that they would do so. The Committee ordered the firm to pay to each of the complainers compensation of Band D for distress and inconvenience, and that no fee note should be rendered. The Committee directed the firm to pay a Complaints Levy of £1,000. 16/19 Residential conveyancing: The complainer complained that the named solicitor and/or the firm had failed to advise about the Capital Gains Tax liability on the transfer of title. The Determination Committee upheld the complaint on the basis that the options available to the complainer should have been explored, and the complainer had not been advised of the tax liability and/or was not advised to seek tax advice from another source. The Committee's view was that the complainer had suffered a loss of opportunity to consider all available options and was not fully informed as a result of the inadequate professional service. The Committee ordered the firm to pay compensation to the complainer of Band D for worry and distress. 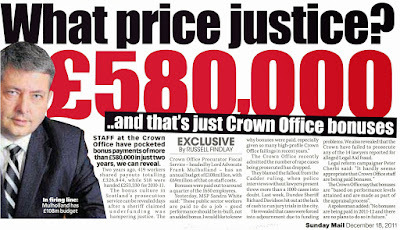 The Committee directed the firm to pay a Complaints Levy of £850. 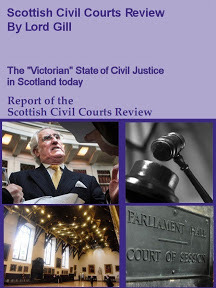 16/20 Litigation: The complainer complained that the named solicitor and/or the firm had (a) failed to advise him at any time about the strength of his claim, (b) failed to advise him of the potential for a costs order being made if the case was lost, and (c) failed to keep the complainer updated or advised about what SLAB required for the funding application. The Determination Committee decided in respect of (a) that the firm had failed to give appropriate advice, either in writing or otherwise, about the strength of the claim. Such advice should have been provided in writing before court proceedings were raised. In respect of (b), the Committee was satisfied that the evidence indicated that the firm had failed to provide appropriate advice regarding potential liability for expenses if the action was unsuccessful, or the potential magnitude of that liability. 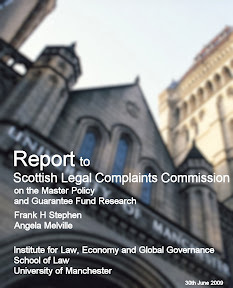 The Committee agreed that the evidence did not support (c), that the firm had advised the complainer of the date of the hearing, that the firm had passed on any requests received from SLAB, or that SLAB had been in touch with the complainer directly. The Committee ordered the firm to pay to the complainer compensation of Level 5 for actual loss and Band C for inconvenience and distress resulting from the inadequate professional service. Additionally, the Committee decided that the firm should not be entitled to charge any fees or outlays for the service provided. The Committee directed the firm to pay a Complaints Levy of £1,500. 16/21 Executry: The complainer complained that the named solicitor and/or the firm had failed to ensure prompt and transparent fee arrangements, having issued a final fee note in June 2014, for work carried out between 2008 and 2013, without any prior warning or discussion. The Determination Committee decided that there was evidence of a failure to set out the basis upon which fees would be charged from the outset and the delay issuing the fee note at the conclusion of the instruction amounted to inadequate professional service. The Committee ordered the firm to pay compensation to the complainer of Band A for inconvenience and distress caused by the inadequate professional service. The Committee directed the firm to pay a Complaints Levy of £50. 16/22 Executry: The complainer complained that the named solicitor and/or the firm had (a) failed/delayed to respond to telephone calls and keep the complainer updated, (b) failed to explain the increase in fees, despite numerous requests, and (c) failed to provide adequate advice regarding an insurance policy claim. The Determination Committee decided regarding (b) that the failure by the firm to keep the complainer updated regarding increasing costs and that the fees had exceeded the original amount quoted amounted to an inadequate professional service. The Committee noted that the firm had failed to provided the complainer with a copy of the Law Accountants fee note, despite there having been a fee rendered for the service and that the letter of engagement was unclear and difficult to understand. The Committee decided that the evidence showed that the firm had (a) been in regular communication with the complainer who had been kept up to date. The Committee could find no evidence to support complaint (c). The Committee ordered the firm to pay to the complainer compensation of Band B for distress and inconvenience and to refund excess fees (approx. £5000). The Committee directed the firm to pay a Complaints Levy of £250. 16/23 Residential conveyancing: The complainer complained that the named solicitors and/or the firm had (a) failed to adequately advise of the position regarding the alterations to the attic space, (b) failed to check/advise the complainer to ensure that the attic alterations were in line with building regulations, and (c) failed to fully advise of the risks proceeding with the purchase without verifying the position regarding the alterations. The Determination Committee decided to uphold all 3 issues as inadequate professional service, as the evidence supported the complaint that the firm had failed to address all 3 matters adequately. The Committee was satisfied that the firm had failed to fully advise the complainer about the potential issues regarding the building control documentation for the alterations, there was a failure to communicate throughout the transaction, despite requests for clarification, and that the firm had not alerted the complainer to the potential risks or consequences of proceeding without the adequate documentation. The Committee ordered the firm to pay compensation to the complainer of Level 2 for actual loss and Band D for distress and inconvenience. The Committee also ordered a full fee refund (approx. £600 plus VAT). The Committee directed the firm to pay a Complaints Levy of £2,000. 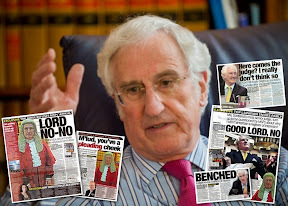 16/24 Family: The complainer complained that the opposing solicitor and/or the firm had failed to obtemper an Interlocutor (which ordered the firm to notify the complainer of a court hearing date), by sending the notice to an address where the complainer had not lived for a number of years. The Determination Committee decided that the firm had failed to fulfil the commitment to the Court, to the client and to the complainer, to prepare the case diligently and to communicate effectively. The Committee accepted that the firm had served papers at an incorrect address, which did not match the address on the Court Record for the action. 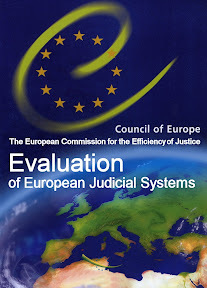 As a result, the Committee was satisfied that the firm had provided their own client with an inadequate professional service, as a client would expect the firm to properly designate the parties and the failure to do so, could have led to additional time and cost to the client for the rectification of any errors. The Committee agreed that there had been a direct adverse impact on the complainer and on that basis, the complaint was upheld. The Committee ordered the firm to pay compensation to the complainer of Band B for the inconvenience and distress caused by the inadequate professional service. The Committee directed the firm to pay a Complaints Levy of £200. 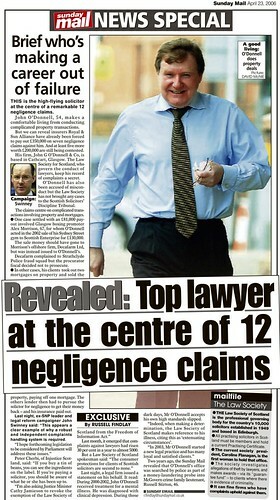 16/25 Litigation: The complainer complained that the named solicitor and the firm had (a) failed to conduct the court case adequately by ignoring expert opinions, reports, evidence and failing to call specific witnesses and had quoted an incorrect name in the court documents, (b) failed to provide adequate advice about the settlement, by failing to advise that the opponent was obliged to issue a VAT receipt, despite instructions that the offer was to be inclusive of VAT, and (c) acted in an aggressive manner and threatened to cease acting on multiple occasions. 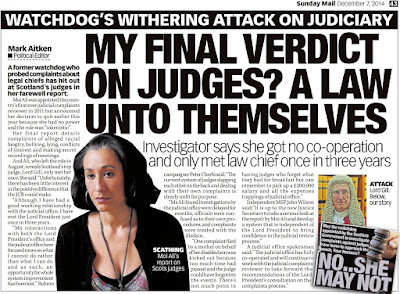 The Determination Committee was satisfied that the solicitor had exercised professional judgement and there was no evidence to show that this was unreasonable. The Committee agreed that the solicitor followed clear instructions and there was no evidence that the solicitor failed to advise adequately about the terms of the settlement. The Committee agreed that the evidence showed effective and clear communication by the solicitor and there was no evidence to support the complaint that the solicitor had acted in an aggressive manner. The Committee decided not to uphold the complaint. 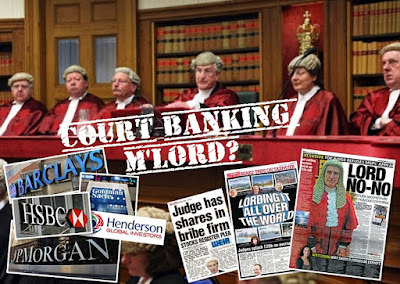 16/26 Family: The complainer complained that the named solicitors had (a) failed to provide adequate information about fees, (b) failed to keep the bank informed of a significant overspend, despite being aware of the limitations in funding, (c) failed to follow instructions by allowing 3 staff members to attend at court, thus incurring unnecessary costs, (d) failed to pay Counsel's fees before taking the firm's fees, and (e) failed to advise Counsel to withdraw from acting. The Determination Committee decided that (a) sufficient information about fees had been provided before the offer was rejected, (b) the bank had been kept up to date and advised of the reasons for the increases in funding, (c) the firm did not accept the instruction to only have 1 person at the court hearing. The firm did not, therefore, fail to fulfil a commitment to the complainer and fees were not unnecessarily incurred, as the need for additional staff was explained and professional judgement in this regard was exercised reasonably. Regarding (d), the Committee could find no evidence to support the complaint that an instruction had been given or accepted that Counsel should be paid in the first instance. In respect of (e), again the Committee could find no evidence to support the complaint about the withdrawal of Senior Counsel from the case. 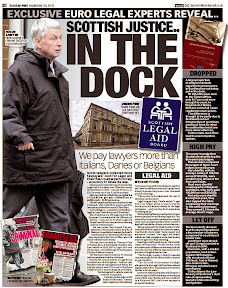 16/27 Family: The complainer complained that the named solicitor and/or the firm had provided inadequate and inconsistent advice about the availability of Legal Aid within the firm. 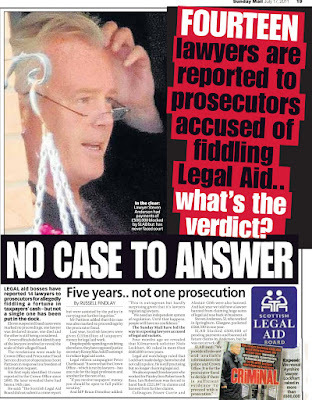 The Determination Committee was satisfied that the evidence showed that the advice provided was clear, consistent and in accordance with the firm's policy on Legal Aid. 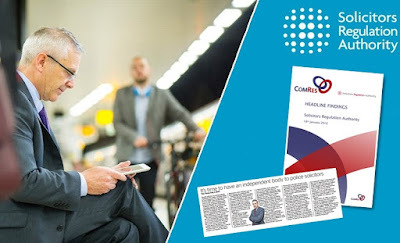 The Committee did not consider that there was any contradictory information provided, or that the quality of communication from the solicitor and/or the firm was inadequate. 16/28 Residential conveyancing: The complainer complained that the named solicitor of the firm had failed to advise the complainer to take steps to confirm the validity of a Letter of Comfort or advise the complainer to insist on a Certificate of Completion from the sellers. The Determination Committee was satisfied that the evidence showed that the firm had adequately advised the complainer of the available options and how to protect the position. The Committee agreed that there was no requirement for the firm to insist on a Completion Certificate. 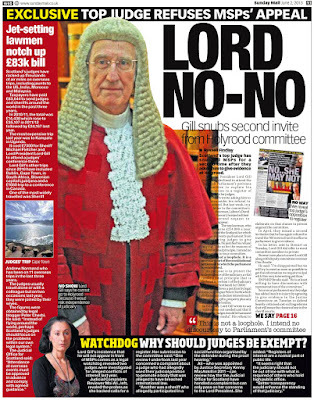 New Lord Advocate’s role in Parliament House titles fiasco. 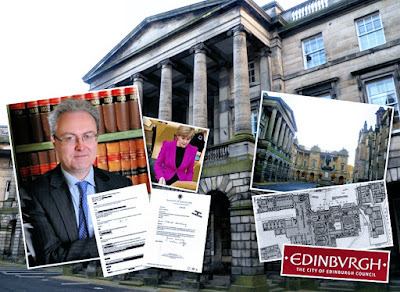 DOCUMENTS obtained from the Scottish Government reveal Scotland’s new Lord Advocate - James Wolffe QC – refused to give expectations of any success on efforts by the City of Edinburgh Council to recover public ownership of titles to Parliament House and the Laigh Hall. 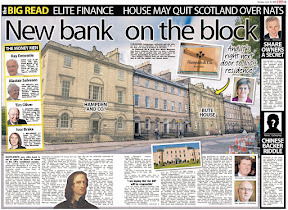 Emails from James Wolffe to the Scottish Government also claim the Faculty of Advocates spent £320K on legal costs and work refurbishing the Laigh Hall – which Edinburgh City Council contend was wrongly taken from public ownership. 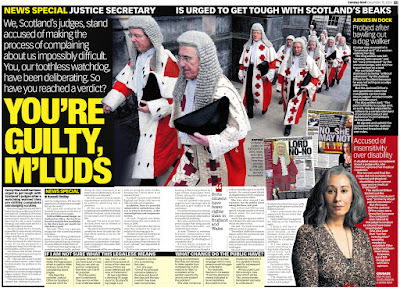 The series of exchanges between the former Dean of the Faculty of Advocates and Scottish Ministers in relation to the loss of public ownership of Scotland’s top court buildings - came to light in papers released by the Scottish Government in response to a Freedom of Information request. 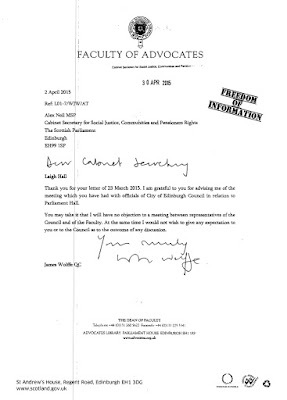 In one letter dated 2 April 2015 to Alex Neil MSP - the then Cabinet Secretary for Social Justice – James Wolffe told the Minister he did not object to a meeting between representatives of the City of Edinburgh Council and the Faculty of Advocates. 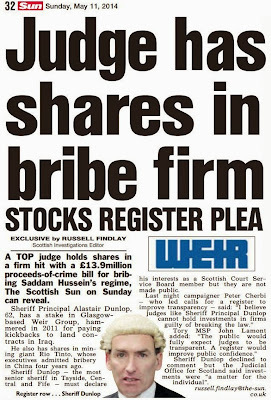 The long time lawyer & QC – recently selected by First Minister Nicola Sturgeon as Scotland’s latest Lord Advocate - also felt confident enough to pass along details of the financial costs of ‘refurbishing’ the Laigh Hall - which the City of Edinburgh Council maintained were part of the common good & therefore owned by the council. 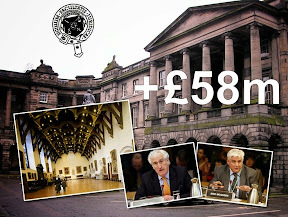 Responding to Wolffe’s claim the Faculty of Advocates paid out over £320K on refurbishing parts of buildings formerly in public ownership - an individual at the Scottish Government whose identity has been censored in the released documents – made light of further coverage of the Parliament House fiasco in the Scottish media. 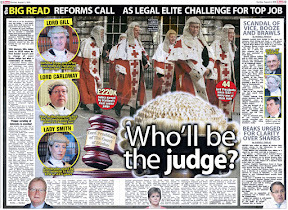 • The Scottish Court Service (SCS) is the current proprietor and occupier of Parliament House. Consequently it is that independent body (and not the Scottish Ministers) that would have to agree to a voluntary transfer of its title to the local authority. 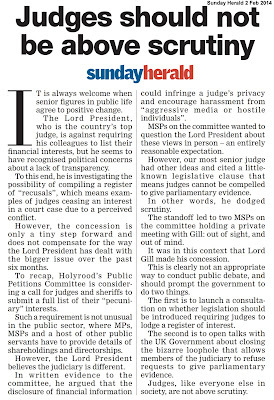 We don't know what view the Lord President would be likely to take on that matter and whether he would agree to the transfer in circumstances where the public body has a valid title. He may, for example, be influenced by the fact that the SCS has recently undertake a major refurbishment of the building complex at a cost of around £58 million. • The finance position is complex. SCS holds a valid title and will have accounted for bot the property and the recent refurbishment works in its accounts: Whilst a transfer to the council would retain the property in public ownership, there are tricky issues around accounting and public finance rules t at would require further investigation. • Although neither a legal nor financial impediment, the title position is very complex. Parliament House is not one building but rather a number that are stitched together, built down the centuries. 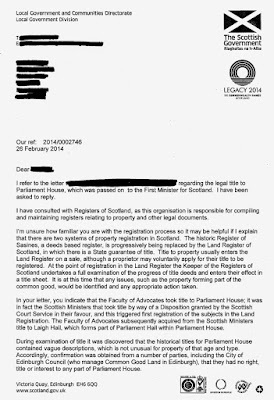 it is not clear whether the entire property was, and remained, part of the Common Good Fund when Scottish Ministers registered a title. This may be relevant when considering whether or not it would be appropriate to transfer the entire property. My understanding is that it would be an expensive exercise to undertake any further examination of the title and it is unlikely that it would in any event achieve any greater clarity. • The Faculty of Advocates holds a registered title to the Laigh Hall. It mayor may not agree to a voluntary transfer, and if they were inclined to do so, we don't know upon' what basis. 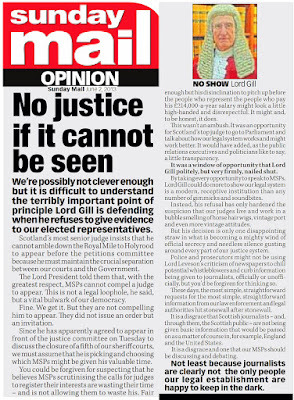 Gill said he would ask Eric McQueen - Chief Executive of Scottish Courts and Tribunals Service, to meet with officials of the Council. 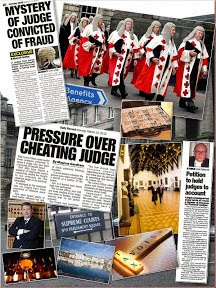 However, after a year of fruitless negotiations between council officials, the Scottish Government, and other parties, the City of Edinburgh Council served writs on Scottish Ministers, the Keeper of the Registers and the Scottish Courts & Tribunals Service on 25 November 2015. 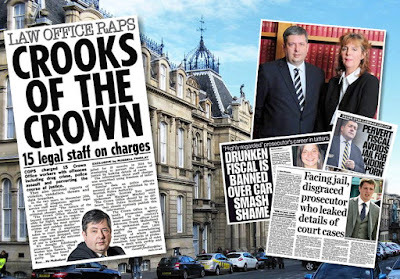 The action by the council - seeking declarator that the City of Edinburgh Council is the owner of Parliament House, High Street, home of the Court of Session – has since been abandoned. 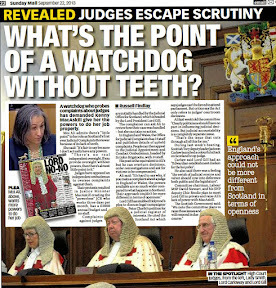 And, throughout the documents – which contain communications between civil servants, briefings to Ministers, land reports and letters from Edinburgh City Council asking for meetings, it was clear Scottish Ministers favour leaving the titles to the nation’s top courts with the vested interests of the legal profession. 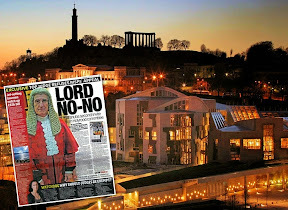 During an earlier check on the titles to the Laigh Hall – Parliament House – Queen Street – ownership stood in the name of “SIDNEY NEIL BRAILSFORD Queen's Counsel, Treasurer of HONOURABLE THE FACULTY OF ADVOCATES Edinburgh, as Trustee and in Trust for said Faculty”. 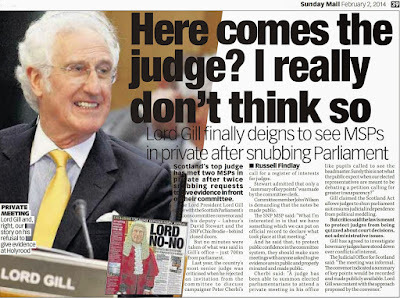 Sidney Brailsford is High Court Judge Lord Brailsford. 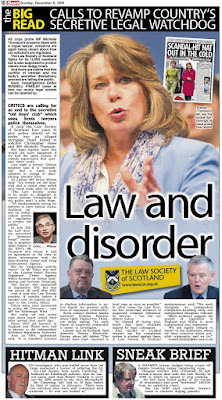 Faculty of Advocates boss to be new Lord Advocate. THE DEAN of the Faculty of Advocates - James Wolffe QC – has been named Scotland’s latest Lord Advocate. 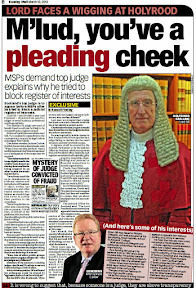 The appointment – recommended by First Minister Nicola Sturgeon and agreed by the Scottish Parliament on June 1st under Motion S5M-00255 – will see Mr Wolffe succeed Frank Mulholland QC as Scotland’s top prosecutor and head of the Crown Office & Procurator Fiscal Service (COPFS). 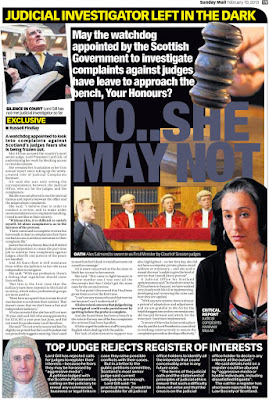 The number two spot at the Crown Office has been filled by Advocate Alison Di Rollo – who becomes the new Solicitor General - after Lesley Thomson quit the role. The appointments of both Mr Wolffe & Ms Di Rollo – come recently after it was revealed a number of Crown Office staff have been convicted of serious criminal offences - including misuse of drugs, violence & offences against the Police. 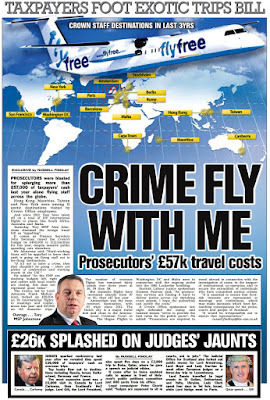 A further report in the media revealed Crown Office staff operating an air junkets racket - reported here: Crown Office jet set junket racket - Files reveal Prosecutors spent £57K on international & domestic air travel as crooks deal plea bargains to dodge law & courts. 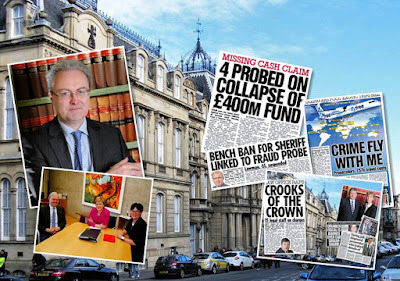 Among long term investigations by the Crown Office awaiting decisions - the new Lord Advocate will face a decision on whether to prosecute anyone in connection with the £400 million collapsed Hedge Fund. 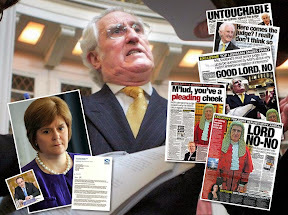 The Heather Capital collapse – probed by prosecutors and Police for three years – has seen links to judges, prosecutors, top politicians, Police and even the Vatican state - revealed in considerable detail in the Scottish and international media. It will also fall to James Wolffe’s Crown Office to decide on whether to intervene in any private prosecution brought by relatives of victims those killed in the Glasgow Bin Lorry deaths case. 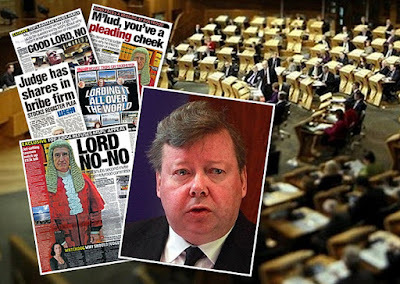 Frank Mulholland announced earlier in March he intended to step down as Lord Advocate after the Scottish Elections held in May. 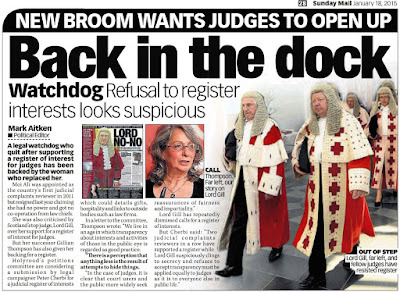 It has since been announced Mulholland – who campaigned aggressively alongside current Lord President Lord Carloway for the removal of the key injustice safeguard of Corroboration from Scots Law - has been made a judge at the Court of Session. The judicial appointment to be taken up by Frank Mulholland QC, will take effect following the retirement of a senator later in the year. 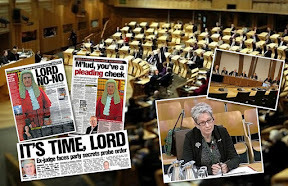 That the Parliament agrees that it be recommended to Her Majesty that James Wolffe be appointed as the Lord Advocate and that Alison Di Rollo be appointed as Solicitor General for Scotland.